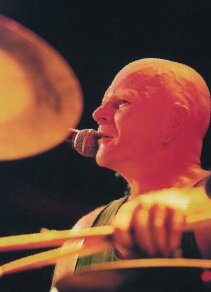 Kirk Syrett has played drums since an early age. For gigs, he uses a TAMA Imperial Star purchased in 1979, nicknamed "Ol' FAITHFUL" by its owner. Cymbals; to quote Buddy Rich "Zildgian, I wouldn't be caught dead live, without them". These include 14" New Beat high hats. 16"Dark Crash (K-series), 20" Crash Ride, 20" Pang, and a 10" Splash (K-series). Kirk prefers to use custom sticks as supplied by Oz-Beat (located in Sydney), including 5A Nylon Tips and 5B wooden tipped. When asked, "Why did you decide to take up drums?" Kirk's reply; "They don't hit back". A huge KISS fan, upon seeing the 'I Wanna Rock n Roll All Night' film clip a few weeks after purchasing his first drum kit (complete with a cymbal that would turn itself inside out when used! ), Kirk's fate was sealed. Horror movies, and things that go creep in the mind inspire Kirk's art form. His style of art originated from live band performances, extending the electric sound platform into the further dimension of bizarre visual images. These images developed into a three dimensional form for live performances, changing the conventional to the freakish and weird. The imagery associated with Kirk's vision mingles with that of fantasy and macabre. The natural progression from the performance use of the bass drum concepts has continued through to the exciting use of three dimensional wall visuals, and sculptures, originating from such sources as tattoo art and predominantly the dark worlds of the artist's mind. The resulting effect is to take the viewer on a strange journey into a unique and fascinating world, providing a view of what was once considered dark and forbidden territory.